Some of the Best Ireland Travel Tips From the Bloggers Who Do it Best! Whether you are going to Ireland for the first time or a seasoned Ireland travel veteran, planning a trip to Ireland is always a fun experience! This is because there is so much to see and so much research before you travel to Ireland. So, we asked a few travel bloggers about what they think you should see and do in Ireland – and the response was massive! 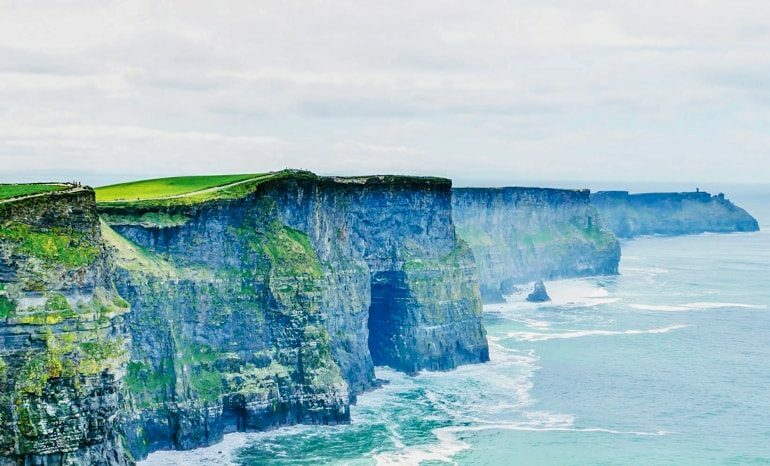 Whether you’re travelling to Ireland on a budget or travelling in Ireland by car, there are plenty of things to keep you busy as you discover the “Emerald Isle” at your own pace and according to your interests! For us, Eric has been to Dublin twice while Lisa has never been to Ireland before. So, while we know a thing or two about what to do and see in Dublin and the best areas to stay in Dublin, this post is super helpful for us to know what we should check out next! So, don’t go searching for an Ireland travel blog for those answers – we’ve got the bloggers’ ideas right here! May we present a curated list of what to know before visiting Ireland – according to the travellers who have lived it! Malahide is a heritage listed seaside town 9 miles (14 km) north of Dublin in Ireland. One of the sights that you don’t want to miss here is Malahide Castle, of which parts date back to the 12th century! The castle has over 270 acres of green space and forest parkland and makes for a perfect day trip from Dublin. 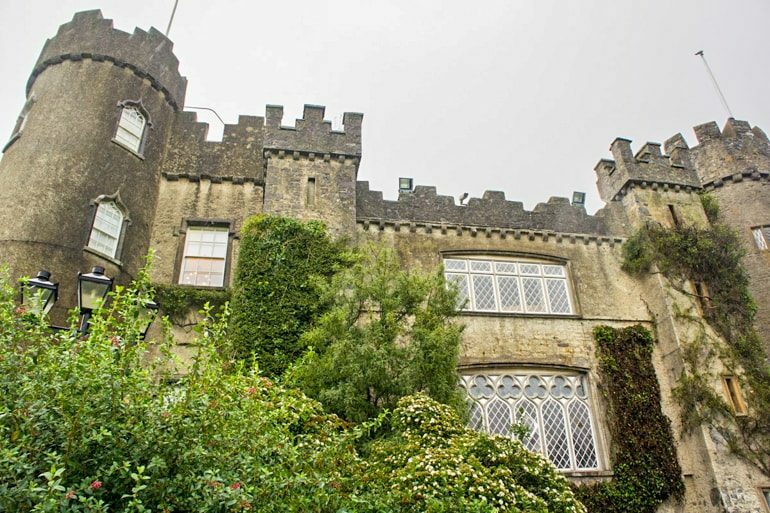 The castle was once owned by the Talbot family for nearly 800 years after Richard Talbot accompanied Henry II to Ireland in 1174 and was granted the lands and harbour of Malahide. Nowadays, the castle is still fully furnished, so you can see in detail how people lived back in those days. I can highly recommend getting a guided tour to get the full story, and to make sure you plan enough time to also visit the gardens with over 5000 different species and varieties of plants! Malahide is open all year round from 9:30 AM to 4:30 PM, they are closed for Christmas. Tickets are €12.50 for adults and €6.50 for children. See More of Ireland: Discover Malahide Castle and Howth on a Half Day Tour from Dublin! Glasnevin cemetery is one of the most important historical locations in Ireland. It is the final resting place of many famous and important people in Ireland’s history. This includes political, religious and cultural leaders. Some of those buried there include Michael Collins (Military and political leader during the war of Independence), Brendan Behan (Poet and Author) and James Larkin (Industrialist). It also holds the distinction of being the first Catholic cemetery in Ireland opening in 1832. One of the most unusual aspects of the cemetery is the Glasnevin trust museum. In this museum, you will learn about the history and the development of the cemetery and why it is such an important location. The museum also offers tours of the grounds, this is the best way to learn about the life, death and importance of many of the people there. 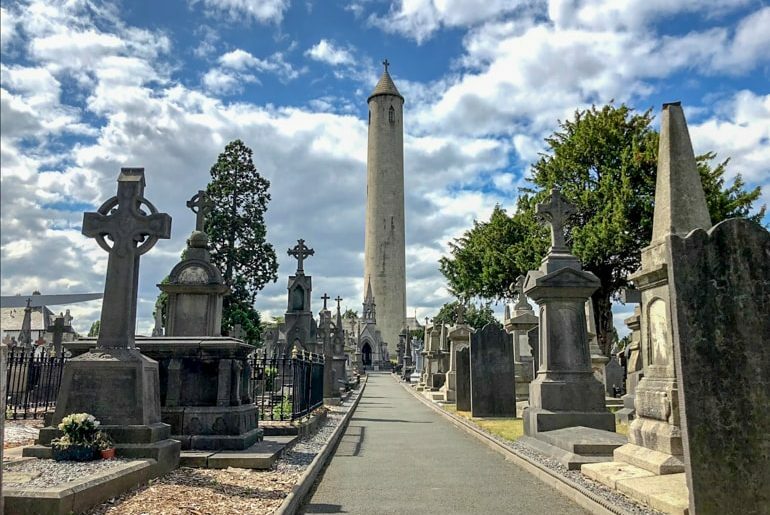 A visit to the cemetery, although slightly unusual will be one of the most educational tours and visits that you could take in Dublin. It will give you a greater understanding of Ireland’s history and of the people who impacted upon it. The cemetery is located in Glasnevin, County Dublin. It can be reached on foot or more easily by public bus from O’Connell Street, on buses 140 or 40. The cemetery is open from 10.00am-6.00pm. During summer months, it might be necessary to book tours in advance. The Wild Atlantic Way is a road trip trail following the west coast of Ireland, along its coastline with the Atlantic Sea. The official route is very simple to follow, with an incredibly well-signposted route of blue signs with ‘ww’ shaped waves on them, which can be followed either north or south. The most comprehensive route would often start at the northern point of Donegal, in Malin Head, before following the west coast of Ireland until reaching the southern coastlines of Cork. 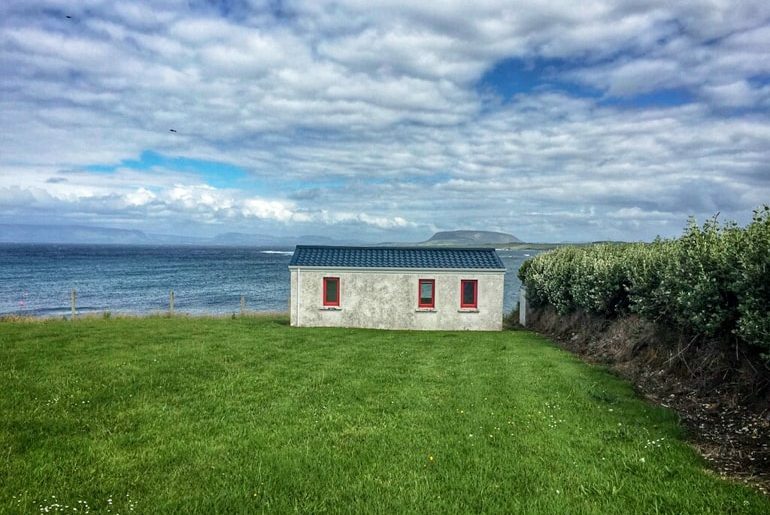 While there is a small airport in the county of Donegal, serviced by Dublin, it is also possible to just jump in at any part along the route of the Wild Atlantic Way. But looking at it logistically, at least for tourists arriving from abroad using rental cars, it is best to start out at Dublin Airport before looping around to the coastline. 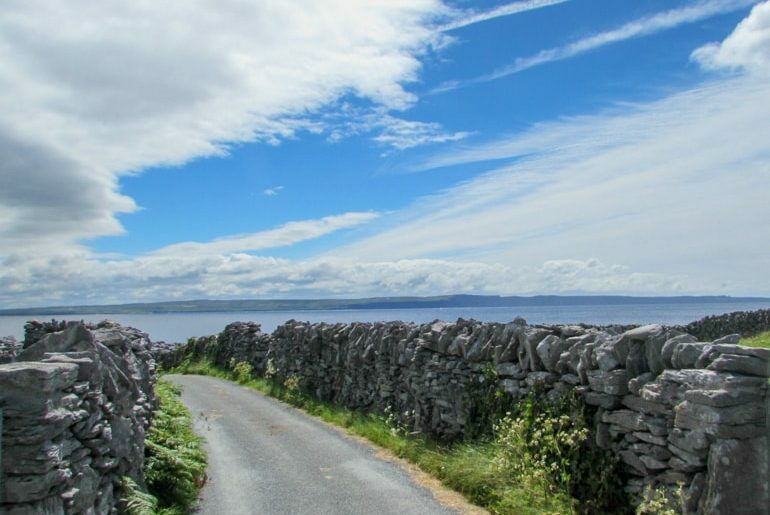 Along the way the route takes in many of Ireland’s iconic landscapes and attractions, like the wild sheep of Achill Island, and the Cliffs of Moher. As well as the cobblestoned streets of Galway City which make for the ideal break in the middle. In total, the full length of the Wild Atlantic Way is 1,553 miles, which could be easily covered in a week or so. Cahir Castle, located in County Tipperary, is one of the largest castles in Ireland and dates back to the 12th century. Sitting on the banks of the River Suir, it is a well-preserved castle that is not to be missed during a visit to Ireland. I visited the castle with my young son in April and there was enough there to keep his attention. Cahir Castle has many rooms and towers to explore, including one which houses an interactive model of the castle. This was by far my son’s favourite room, along with the cannons that sit within the Inner Ward. There are other exhibitions within the castle, and many rooms house furniture dating back several centuries. The portcullis can be viewed over the main entrance as well. There are spectacular views from the windows in the keeps across both the gardens of Cahir Castle and the River Suir, especially on a nice day. 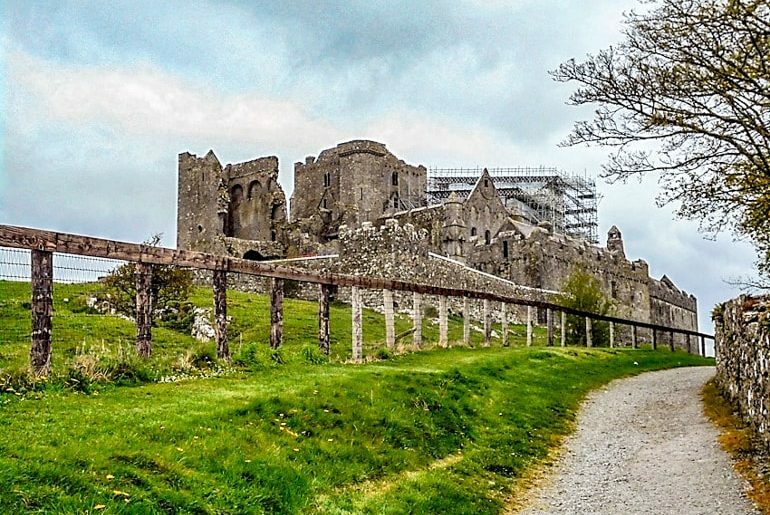 A visit to this castle is a must for anyone visiting Ireland and can easily be combined with a visit to the Rock of Cashel, as we did, as they lie just 20 minutes apart by car. My recommendation is to visit the Rock of Cashel first, as it can be very busy, and then travel to Cahir Castle. 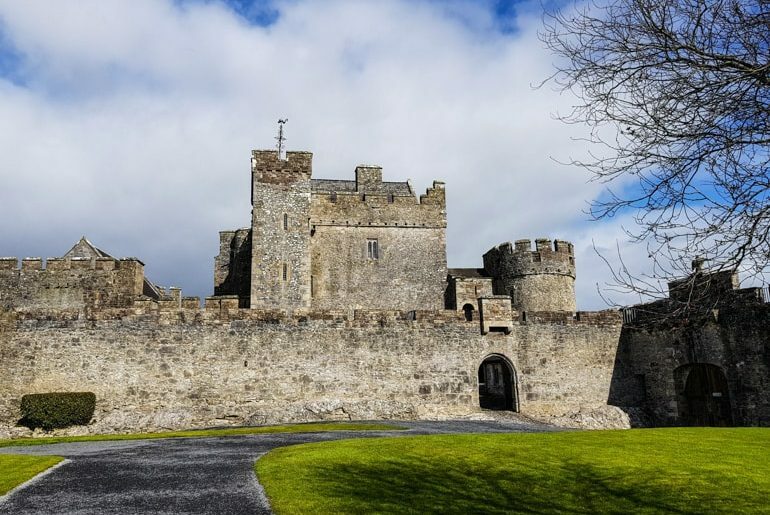 Discover Irish Castles: Check out Cahir Castle, Blarney Castle, and The Rock of Cashel on a Trip From Dublin! 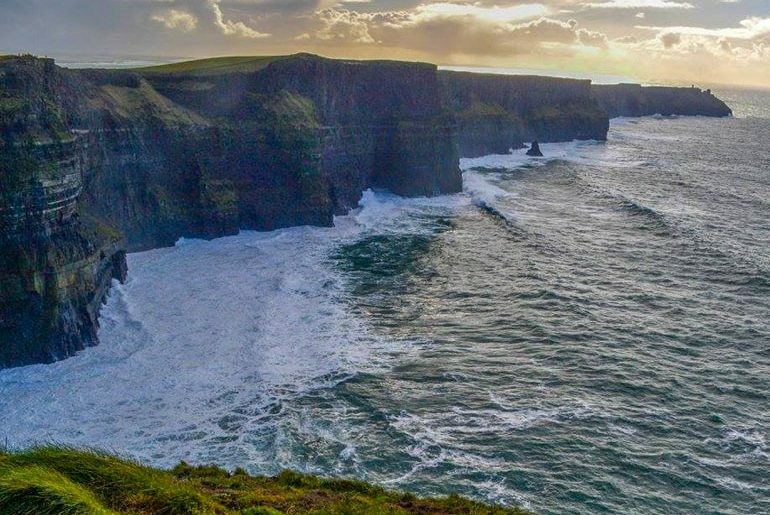 Situated in County Clare on the West Coast of Ireland, the Cliffs of Moher is one of Ireland’s most beautiful natural attractions. The cliffs are 8 km in length and tower 230 metres above the ground at their highest point. To say the view is spectacular would be an understatement and, although it can be very touristy, it’s definitely one of the top things to do in Ireland. If you’re lucky enough to get good weather, the experience is even more magical. On a good day, not only are all of the cliffs visible, but you can also see all the way to the Aran Islands, Galway Bay, and the hills of Connemara. To have a chance of getting that good weather, aim to visit sometime between April and August. July and August are the busiest months, so the most ideal month would be either April or May as this would allow you to avoid the crowds as well. Photo Credit: Past the Potholes – thank you for the amazing photo!! Just west of Galway is the stunningly beautiful Connemara National Park. With mountains, coastline, lakes and even Ireland’s only fjord there is plenty to see and do. We spent a day driving around the region and explored various places along the way. This was probably my favourite place in all of Ireland! 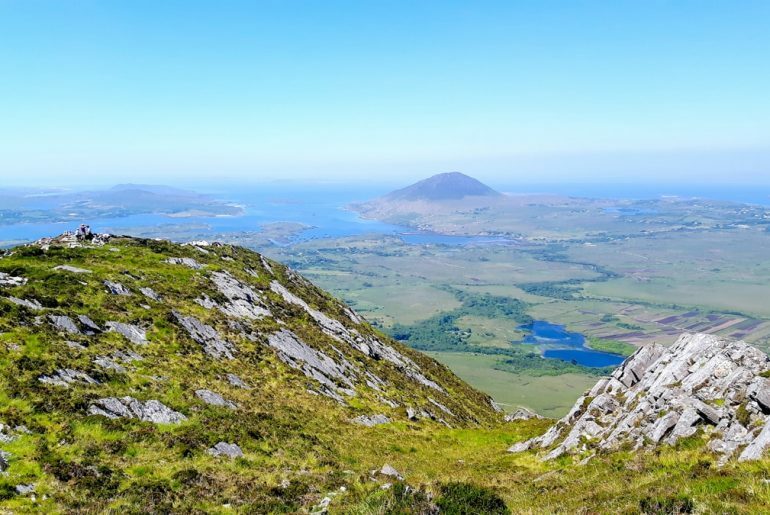 When you visit Connemara National Park (and you definitely should!) make sure to stop at Killary Fjord and perhaps hike along its edge if you have the time. Kylemore Abbey is a must see, even if you don’t pay to go inside. Letterfrack is the perfect starting point to hike various trails in the park. We recommend Diamond Hill for amazing views over the entire region but there are plenty of options. Take a drive around Sky Road for beautiful views of the rugged coastline. If you have the time, spend a couple of days in the park and stay in or around Clifden. 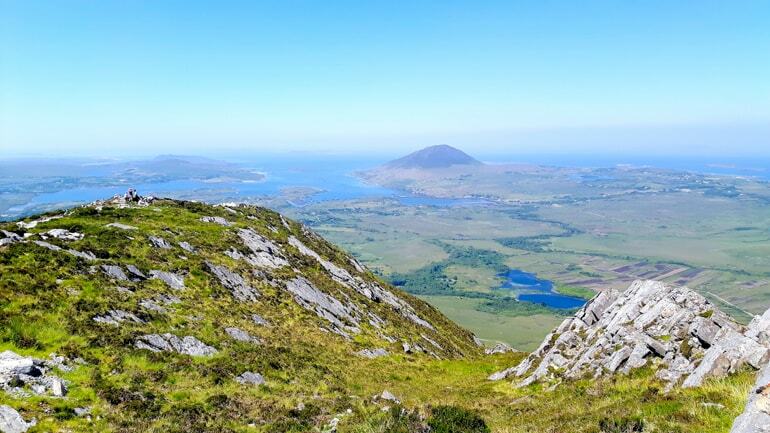 If, like us, you are short on time Connemara is easily accessible from Galway as a day trip. Hiring a car will give you the best flexibility to explore at your own pace but there are also tours leaving daily from Galway. If you go independently, try to leave before 10 am when many tours begin. Looking for More Nature and Castles? Visit Connemara and Kylemore Abbey on a Tour From Galway! Achill Island in County Mayo was the first place I visited in Ireland, and what an introduction. We crossed the short bridge to the island, to be greeted by a typical Atlantic storm, the dark outlines of mountains occasionally appearing through the grey murk. Achill is Ireland at its wildest, which is my wife took me there first. It bears the full force of the weather from the ocean, both wind and rain. It made the news in 2017 when one of its beaches, Dooagh, re-appeared after a storm – having been washed away 33 years before. I recommend Achill because of the wild feel of the place, a desolate, sometimes harsh beauty that blows you away when the sunlight bursts through and flickers along the mountain-tops. 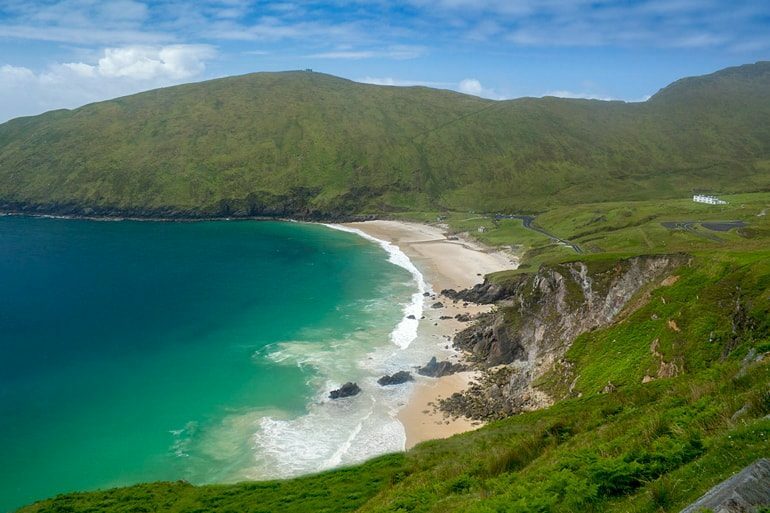 It also has one of the most beautiful beaches I’ve come across in Europe, at Keem Bay, washed by almost-tropical turquoise waters yet surrounded by typical Irish mountain and moorland. The German author Heinrich Böll was a regular visitor in the 1950s and 1960s, and the cottage where he stayed near Doogort is now an artists’ residence. This is close to the mountain of Slievemore, where you can see the poignant ruins of a village abandoned during the potato famine of the late 1840s. Achill made a big impression on me – it was the first place I saw in Ireland, and the first to which I’ll return. 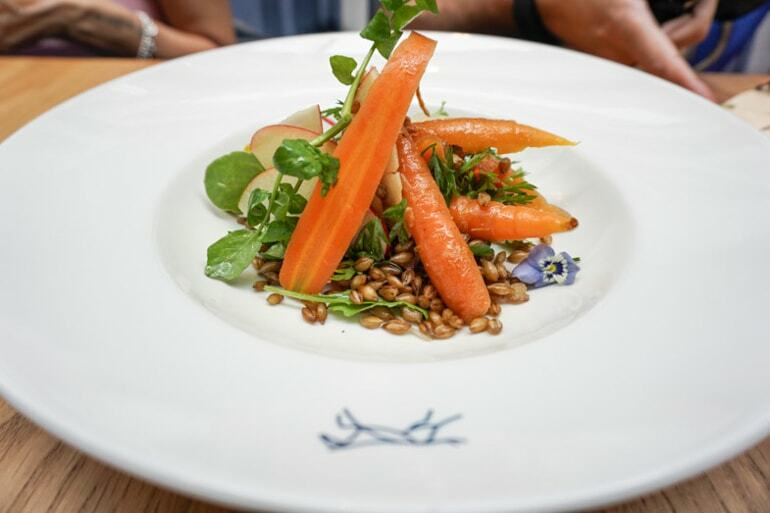 It’s not just the farm to fork ethos that is celebrated in Ireland’s Ancient East. An Irish apple orchard has also coined the phrase ‘pip to sip’ – clever, eh? The Irish family run businesses of Ireland’s Ancient East are creative, resilient and all have a story to tell. Like the craic? The chat is as addictive as the produce here. The road trip takes you from Killashee to Tipperary. You’ll stop at Thomastown and Kilkenny to sample the fish, meat, vegetables, chocolate, whiskey and beer while staying in accommodation older than the USA. Foodies should visit Kilkenny in November for the Savour Kilkenny food festival. Go soon and go with an empty belly! Want to See More of the Ancient East? Discover the Beautiful Celtic Region on a Full Day Tour From Dublin! Off the west coast of Ireland sit the 3 tiny Aran Islands: Inishmore, Inishmaan, and Inisheer. Small and beautiful, the Aran Islands are known for their isolation and for being one of the last remaining places where Irish is still the primary language (students from the mainland come to visit every summer to stretch their language skills). As the closest to the mainland and the smallest, Inisheer makes a wonderful day trip during any Ireland trip. Ferries leave from Doolin, which is also a jumping off point for visiting the Cliffs of Moher, making it easy for tourists to access. Stepping onto Inisheer is like stepping into another land: ruins dot the landscape, horse and buggies are a regular sight (frequently, though not always, there for the tourists), the beach glistens with a turquoise hue that looks more like it belongs in the Caribbean than the northern Atlantic, and a massive shipwreck dominates one portion of the rocky coastline. Come to Inisheer to take a glimpse into an Ireland of the past, and an Ireland that’s a little bit wild. During our last trip to Ireland, our most memorable stop was in Dingle. 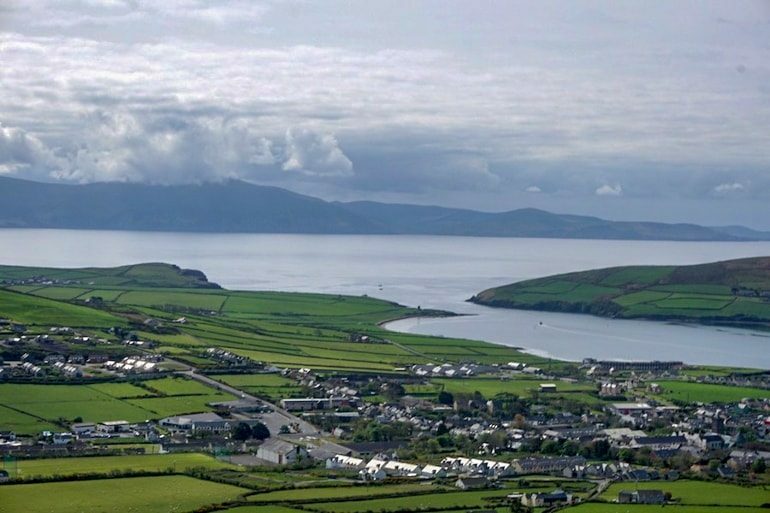 It is a small town on the Dingle Peninsula that is easy to explore. Make sure you enjoy some ice cream at Murphy’s while you are there, especially the sea salt flavor. For dinner, take advantage of the plethora of fresh seafood options and in the evening, be entertained at one of the local pubs, mainly Murphy’s or Paul Geaney’s. Take advantage of all things you can do outside while you are there and take in as much scenery as possible. We went Kayaking up against the cliffs and rocks and made our way into a small cove thought a cave. It was a clear day and we could see to the bottom of the sea in the cove. At the end of the trip, we backed into one other cave and just as we sat there watching as the local dolphin, Fungi, beached right in front of us! If you are a fan of horses, go for a horseback ride up the hills behind the city to enjoy an amazing view of the town. If you can time it perfectly, we recommend going in April or October. This will help you avoid the crowds without dealing with freezing weather. Dingle Has So Much To Offer: Discover the Whole Dingle Peninsula from Killarney! When you think of Ireland, you can’t help but picture green landscapes, castles, pints of Guinness and lots of sheep. 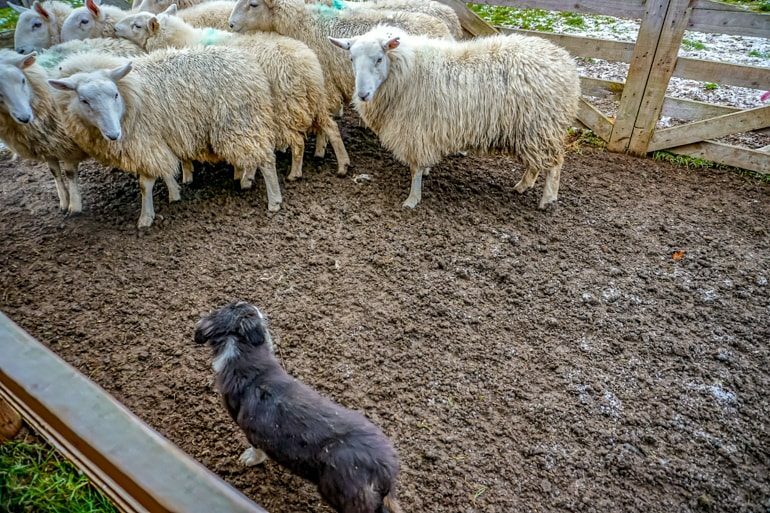 If you are looking for an activity that isn’t too far from Dublin City and doesn’t involve whiskey or beer, you may want to check out a working sheepdog demonstration. Having lived in Ireland for almost 3 years, I am always looking for fun things to do in and around Dublin. So, when I learned about the Irish Working Sheep Dogs in County Wicklow, I knew I had to see what this was all about. Michael Crowe is a well-known sheepdog handler in Ireland who delivers an engaging demonstration that will leave you in awe. Learn all about the Cheviot sheep of County Wicklow while you watch Michael and his uber intelligent border collies at work. We had the pleasure of meeting a 4-month old pup who was in the early stages of training, but you could already see the instinctive traits that make this breed perfect for the job. Michael also explained that the sheep are changed regularly, so they don’t get used to the procedure and to ensure you get an authentic demonstration. This activity is ideal for animal lovers, young or old, who want to experience a real Irish tradition. Want to See More of Wicklow? Discover Wicklow and Kilkenny on a Day Tour From Dublin! 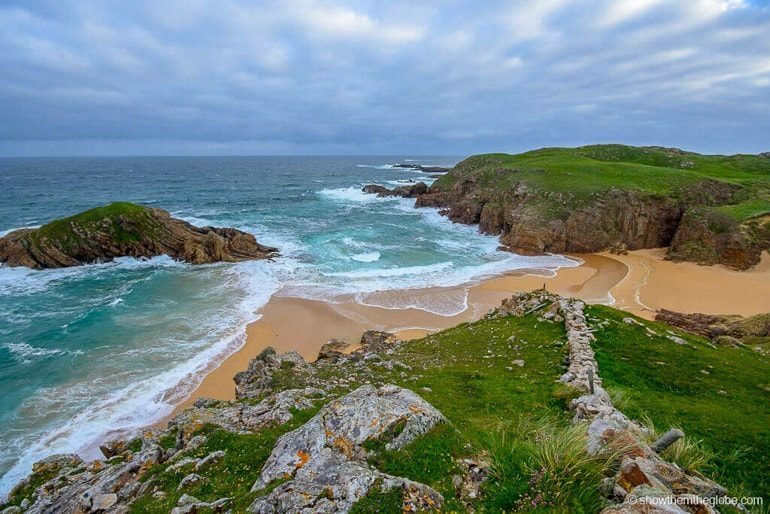 The intriguingly named Murder Hole Beach is one of the most beautiful and remote beaches in Ireland and is located in a quiet corner of the Wild Atlantic Way on the coast of Co. Donegal. Accessed from Melmore via a hike across working farmland with the kind permission of the local farmers, any visitor who takes the time to travel to the area and make the hike from the main road is rewarded with one of the most beautiful and wild beaches they will ever see. Murder Hole is dotted with small caves and surrounded by stunning cliffs and is an untouched gem. We visited Murder Hole for sunrise and had the entire beach to ourselves for hours as we watched the deep green wild Atlantic waves smashing into golden sands of the beach. As for the name, while no one knows exactly how it got its eerie title many agree it’s likely derived from the aggressive tidal currents that make swimming at the beach very dangerous. When was the last time you had a chance to venture into a 5000-year-old structure? Visiting a cairn burial mound is a mysterious and mystical experience not to be missed. One of the most celebrated and epic ones to visit is Newgrange, located an hour North of Dublin. At first glance, it doesn’t appear to be more than a very big grassy mound, which is not what you’d expect from a star attraction. Don’t be fooled by its initial appearance as this 5000-year-old Neolithic monument is a UNESCO World Heritage Site for good reason. The structure which was supposedly a burial chamber for the elite of its clan is also thought to have been used for ceremonial rituals to the gods in hopes of a bountiful harvest. Expect to spend about a half hour or so exploring the outside, then the magic happens when you visit the interior, venturing deep inside the central chamber. Crouching through, you’ll get a very unique viewpoint from the middle of it. During this guided tour, the lights are turned off in order to re-enact the sun’s perfectly aligned rays that carry naturally all the way to its center once a year during Winter Solstice. It’s an incredible experience to see the inside of such an old structure, one that has been standing for over 50 centuries. 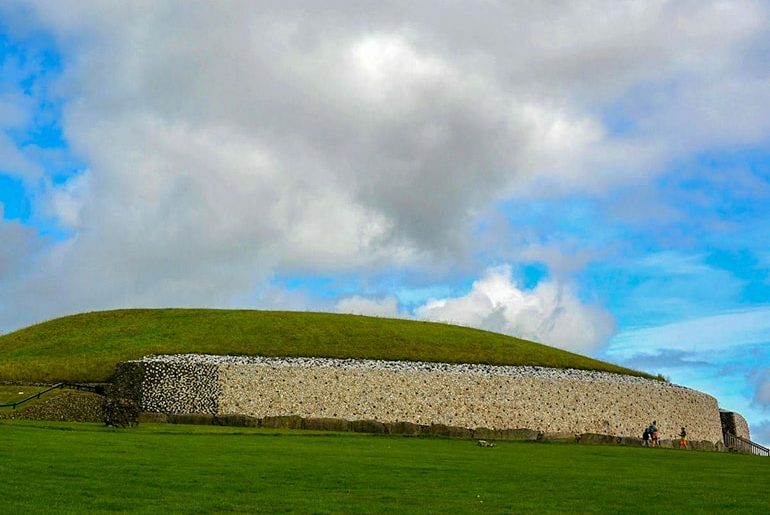 Newgrange is a must-visit destination, we really enjoyed exploring this marvelous piece of history during our 2-week self-drive tour of Ireland. Think Newgrange is Cool? Discover the Rich History of the Monument and Ancient Places on a Tour from Dublin! There are so many fabulous places to explore in Ireland but I’m so lucky that the majestic Ashford Castle and picture-perfect village of Cong are right on my doorstep. Ashford Castle itself is the ultimate in luxury so you may not be able to stay there (but check out the hotel here) or even have a look inside without saving up your pennies. Even to drive down the winding driveway through the golf course will cost you €5 per car just to walk around the stunning grounds. However, local tip here: If you park at the rear of the castle bedside Cong church you can spend many hours walking the grounds and exploring the forests for free. There is also a ferry that departs twice daily in the summer if you fancy taking in Lough Corrib. The village of Cong itself should not be ignored. Cong, and more specifically Pat Cohens pub, was the setting for John Wayne and Maureen O’Hara’s The Quiet Man. In fact, a statue of the pair adorns the streets of Cong. The locals of Cong are very proud of this and you will see many references to the movie and shops selling memorabilia. This pub has been given an update inside although the exterior is just how you would have seen it in the movie. The food here is unbelievable so be prepared for a wait if you haven’t booked a table. Cong also features a ruined medieval Abbey, where Rory O’Connor, the last high king of Ireland spent his last years. It is also the origin of a piece of Celtic art in the form of a metal cross shrine called Cross of Cong. You could easily spend the day exploring the Abbey and the attached nature trail in the woods, all for free. 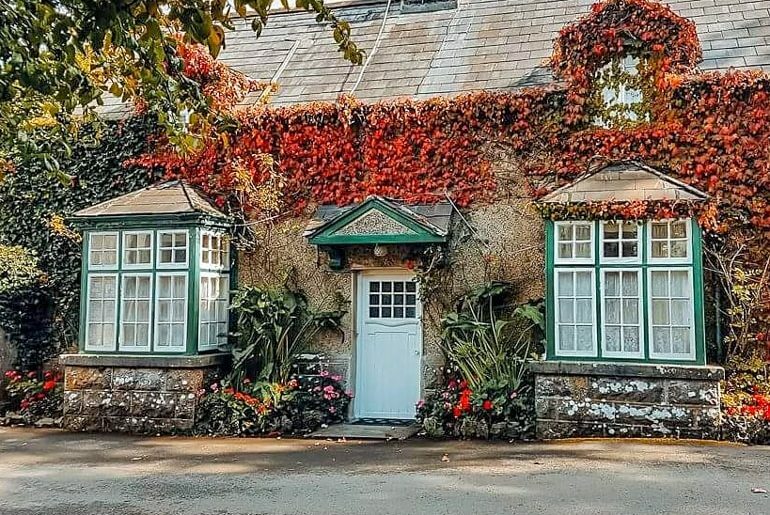 There are some beautiful walks along the river and if chocolate box cottages are your thing you would really enjoy a day spent here. The Rock of Cashel is one of Ireland’s most notable historic sites. It was once been the seat of the kings of Munster, one of Ireland’s 4 states, and it is said to be the historic site of the conversion of the kings to Christianity, by St. Patrick, in the 5th century. Legends about the Rock are varied, from how this singular hill in the midst of County Tipperary came to be, to the manner that the King was baptized by St. Patrick. The Rock of Cashel is quite impressive, even from a distance. However, we recommend exploring the grounds and taking a guided tour. The tour includes the cathedral and the Cormac’s Chapel, and other notable rooms. Some remarkable features that are explained include the crypt, a sarcophagus that is believed to have been for King Cormac himself, a high cross, and the cemetery. We could not help but wonder how gorgeous these rooms must have once been. The chapel was once Catholic, richly decorated with gilding and frescos. These works had been whitewashed by the incoming Church of England, as they were viewed as sinful indulgences. Traces can be seen beneath the fading whitewash. Looking down from the Rock, Hore Abbey can be seen in the pasture. Once a Cistercian Abbey, it is also an impressive structure. There is no parking for Hore but with a walk it is free to explore. See the Rock of Cashel and More: Discover the Rock of Cashel, Blarney Castle, and Cahir Castle on a Tour From Dublin! When you’re researching Ireland’s Hook Head Peninsula on the South East Coast of Ireland, you’ll come across words like untouched, ancient, and breathtaking. It’s one of many beautiful areas in the region of Ireland nicknamed the Ancient East. Its landscape is dominated by stone walls, small towns and smaller streets, photogenic ruins, amazing coastlines and beautiful vista’s. 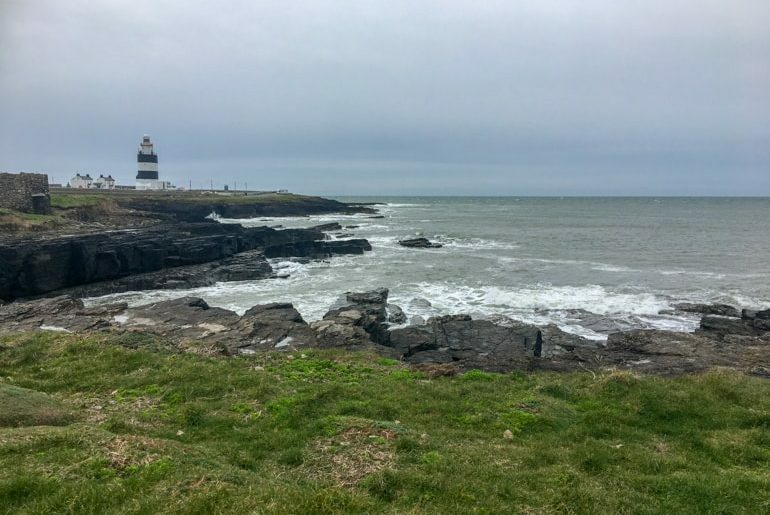 The top attraction of Hook Head Peninsula is the lighthouse. The Hook Head lighthouse holds the honor of being the oldest operational lighthouse in the world. The coastline on the way to and around the lighthouse is spectacular. Think jagged cliffs, blue water and salt spray. You can book a tour or just take a look around the grounds. Near the lighthouse you’ll find Loftus Hall. It’s a pretty spooky place. The little town of Slade with its photogenic fishing boats and castle are also nearby. Down the road are several small towns and beaches as well as Duncannon Fort and Ballyhack Castle. Also close are the Dunbrody and Titern Abbeys. Dunbrody Abbey is a wonderful place to walk along ruins and get some great photos. Titern Abby is partially restored and has a lovely creek side forest trail. Be sure to look out for fairies. The city of New Ross has a really fun floating museum in the Dunbrody Famine Ship with many other worthy attractions nearby. If your Irish vacation bucket list includes scenery, ruins and small towns – Ireland’s Hook Head Peninsula in the Ancient East is sure to have your wish list covered. Howth is a great day trip (or half a day trip, if you must) from Dublin. To get there, you’ll need to ride their DART Train – a light rail that only takes 30 minutes from Dublin’s city center, and around an hour from Bray. It is a great place to visit because of the excellent fish & chips shops and also the hiking, lots of hiking. The dirt paths go up on the hill and give you an excellent view of the water and all over the coast. Stunning scenery all over, and so many photo spots. It takes a few hours to go around the coast by hiking, or you can just sit around by the lighthouse and people watch. There are lots of people on a sunny, weekend day. 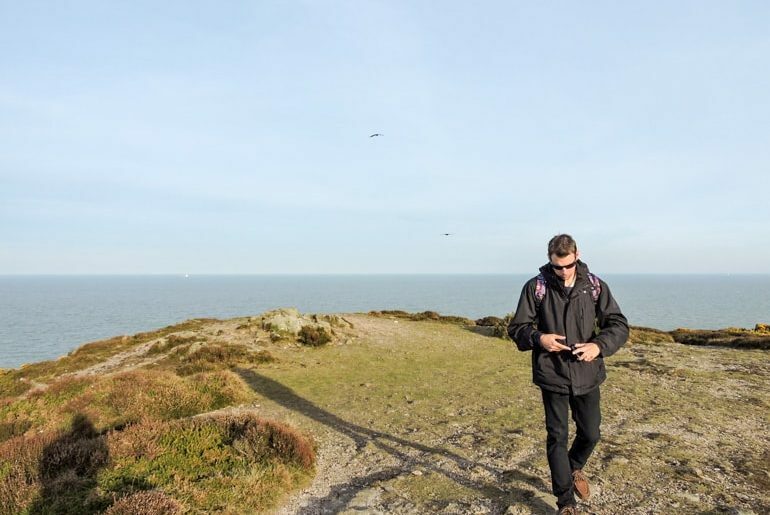 If you have the time or don’t want to hike, you can walk up the hill to go see Howth Castle, the National Transport Museum, or a local market for European delicacies or souvenirs, which is located right in front of the train station. See Howth and Castle: Discover Ireland’s North Coast on a Half Day Trip From Dublin! 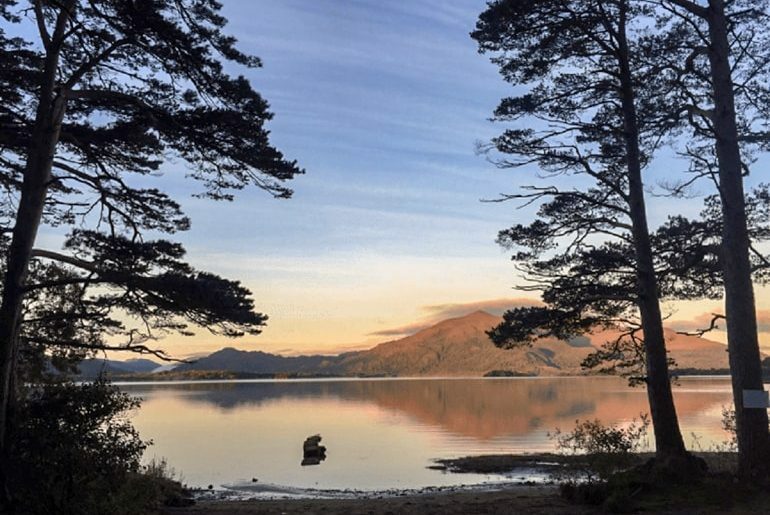 You drive through Killarney National Park as part of the famous Ring of Kerry drive, but it’s definitely worth a stop. You could easily spend a whole day exploring the park, it’s a beautiful area with lots of history and things to do. The first thing you should see is the Muckross House, a 19th-century Victorian mansion now owned by the state. You can tour it and see where Queen Victoria stayed during her visit to Killarney. The Ladies View is named after Queen Victoria’s ladies in waiting because it’s a spot they enjoyed. You should also take a boat to Ross Castle, a 15th-century castle which is rumored to be haunted. If you like ruins, you should also visit Muckross Abbey. I thought the tree growing inside was pretty and I enjoyed exploring the nooks and crannies. In Killarney National Park, you will also find lots of hiking. We did a short easy hike to see the Torc Waterfall that would also be suitable for children. There are also some trails around the lake that are pretty flat. If you prefer, you can also rent bikes to see more of the park. 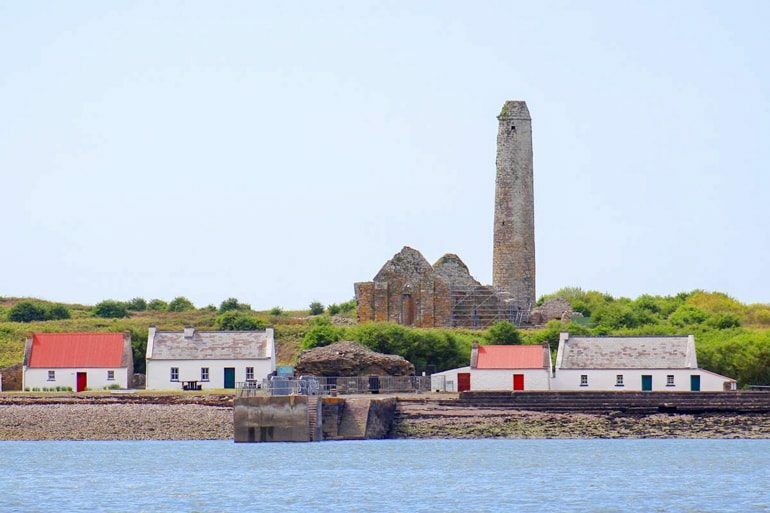 The Scattery Island is a little-known gem in the west coast of Ireland. It is receiving growing attention lately though because the island won the European Destination of Excellent (EDEN) award for Irish Cultural Tourism in 2017. Scattery is an old monastic island located in the Shannon estuary, in county Clare. It has been inhabited for over 50 years but it is open for visitors from May to September. There are many things to see on the island which is steeped in history dating back to 535 AD when monks first took residence there. You can find many ruins of churches and chapels from the old monastery, an Irish Round Tower, a light house and an artillery battery from more recent history when the island was home to a thriving community. This is a great place to visit if you are interested in walking around historic sites, learning about ancient Celtic history, or just want to have a relaxed day out. The scenery is beautiful and the island offers gorgeous panoramic views of the Shannon statuary, County Clare and County Kerry in Ireland. The Sliabh Liag Cliffs are believed to be the highest in Europe and offer absolutely spectacular views and the rough and rugged landscape is a sight you must see before leaving Donegal. 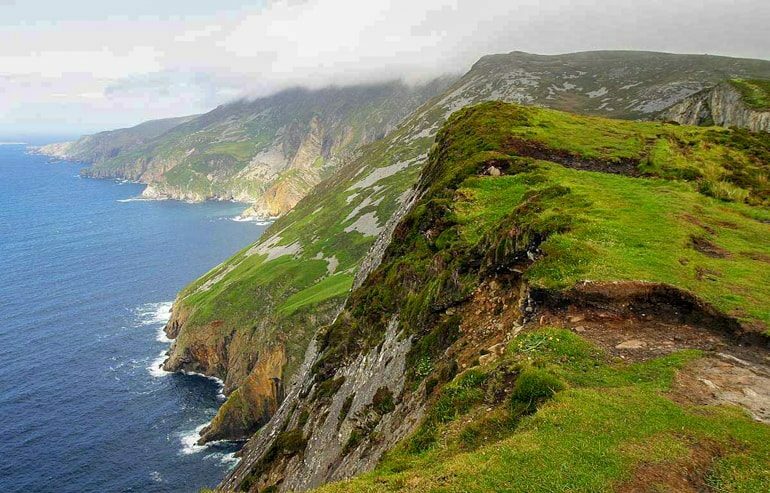 Located in the Gaeltacht area (Gaelic speaking) of County Donegal Sliabh Liag are the highest accessible sea cliffs in all of Europe and the cliff face of Bunglas rises over 600m above the ocean. There are several ways up the mountain and you can also see the view from a boat tour, which starts at Teelin Pier. In season, there is a shuttle bus to take you to the top viewing point, but during quieter seasons, you pass the second parking lot and enter the trail by car through the gate, simply close the gate behind you and drive up to the viewing point. The walk up from the second parking lot is around a kilometer and a half and is uphill all the way. There are no instructions anywhere but you are allowed to drive up beyond the gate, which keeps the sheep in. The views are incredibly dramatic and can be quite frightening. There is a walk called One Man’s Path, which loops around the cliffs, and trust me if you are afraid of heights don’t do it, but if you can the views are simply stupendous. Up here, you can see the Sligo Mountains, Donegal Bay and the Atlantic stretching into infinity. Dublin has a long history of being a city of writers. From novelists to playwrights and poets, Dublin has been a muse throughout the centuries. Perhaps no author has even been quite so inspired by the city of Dublin as James Joyce, one of Ireland’s most famous writers. From his debut work Dubliners which featured the everyday lives and struggles of middle-class Irish people prior to their independence from Britain to his masterpiece, Ulysses, Dublin has loomed large in all of James Joyce’s work. As a result, Dubliners are quite proud of having one of the writing world’s most creative minds as their own. The James Joyce Center honors his legacy, featuring three floors of exhibitions dedicated to his work. The Center is also home to the door of 7 Eccles Street, the door made famous by Ulysses. In addition to being a museum and research center, the James Joyce Center also organizes Joyce-themed walking tours of Dublin and special events such as Bloomsday, an annual celebration every June 16th that celebrates Joyce’s writing, chosen for the fact that it is the day on which the entire novel of Ulysses takes place. A few years ago the Sligo tourism board ran a campaign with the hashtag ‘SligoWhoKnew’ and this sums the place up perfectly. It is a picturesque county in the North West of Ireland with an abundance of natural beauty. It’s a place where you can hit the beach, walk in the woods, relax by the lake, or climb a mountain in one day. It also forms part of the Wild Atlantic Way. To us Sligo is Ireland’s best-kept secret. It’s the place to go if you want an authentic Irish experience that is a little less touristy than the likes of Kerry, or Cork, or Dublin of course. In fact, Sligo is so beautiful that it inspired some of the greatest works of poet W.B Yeats. There are several tributes to Yeats throughout the town so do keep an eye out. If you love the beach then head to Strandhill and take a walk along the sand dunes. It is also home to one of Ireland’s best surf schools if you are little more adventurous. There is also the incredibly beautiful Aughris Head. Walk along the coastal path and you will have prime views stretching out over the Atlantic Ocean. After a long day exploring, head back into town for a few drinks and a hearty Irish meal. The locals are really friendly and great to chat with. There are some really fantastic and authentic pubs in Sligo playing ‘trad music’ which is a genre of Irish folk music. But the best thing is you get to experience Ireland properly here without the tourist traps and the hype. Sligo really is, Ireland at its finest. 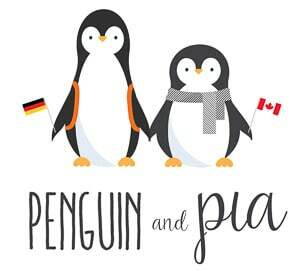 Recommended by us at Penguin and Pia! If you’re in Dublin, if goes without saying that a tourist rite of passage is to visit the famed Temple Bar Area. 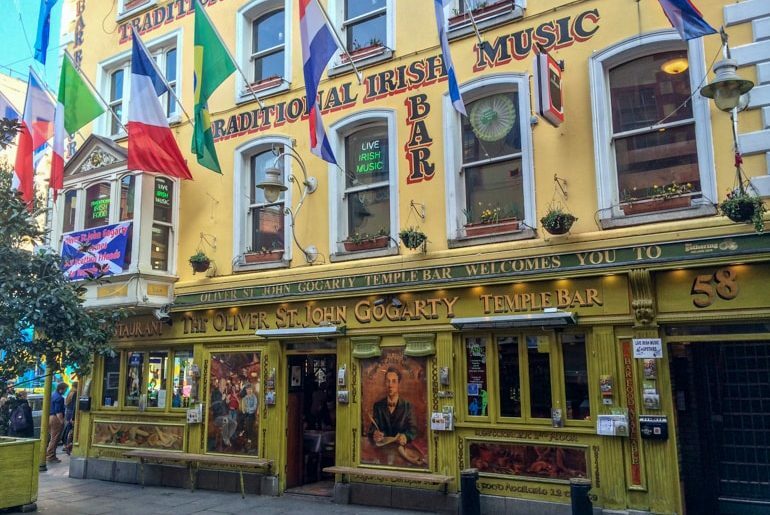 The few blocks that make up the “cultural centre” of Temple Bar are loaded with authentic pubs and restaurants that are full of live music, hilarious characters, and of course, loads and loads of alcohol! Specifically, you’ll find all the classic beers like Guinness and Harp as well as Irish Whiskeys like Jameson and Bushmills. You can visit the famous Oliver St. John Gogarty Pub (seen above) and of course the famous Temple Bar Pub. Opened in 1840, Temple Bar – the pub – is a classic spot to check out before diving in deeper into more local places you can find in the area! I found that one of the most fun things to do in Dublin is to go on the Dublin Literary Pub Crawl. A nightly pub crawl (obviously), with a significant twist! Each pub on the crawl has played a huge role in Irish literature. Run by Colm Quilligan, each tour is conducted by him and another actor. They tell you the history of the pub and the relation to Irish literary history. Then they do performances from pieces from Irish literature. 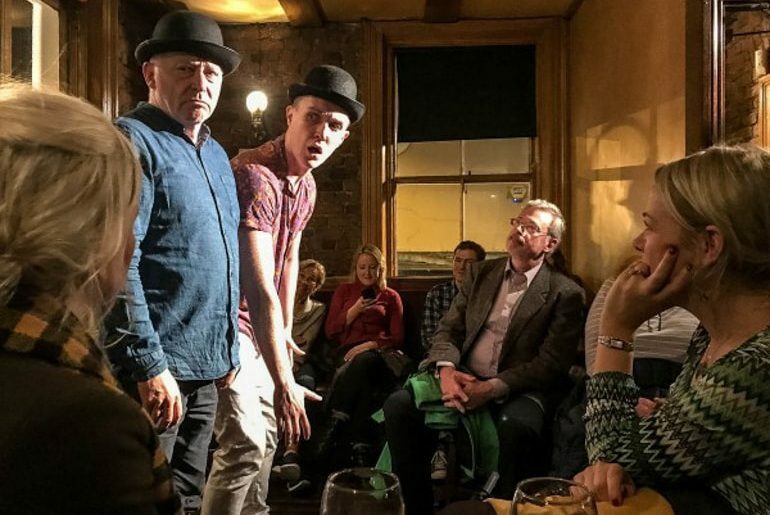 Opening with a selection from “Waiting for Godot,” the literary pieces are significant while the performances and the pints make them accessible. From the first performance through the end of the night’s trivia competition, I found the entire evening a delight and uniquely Irish. Just make sure to bring cash for your drinks, wear comfortable shoes you can walk (a short way) in, and dress appropriately for the weather! 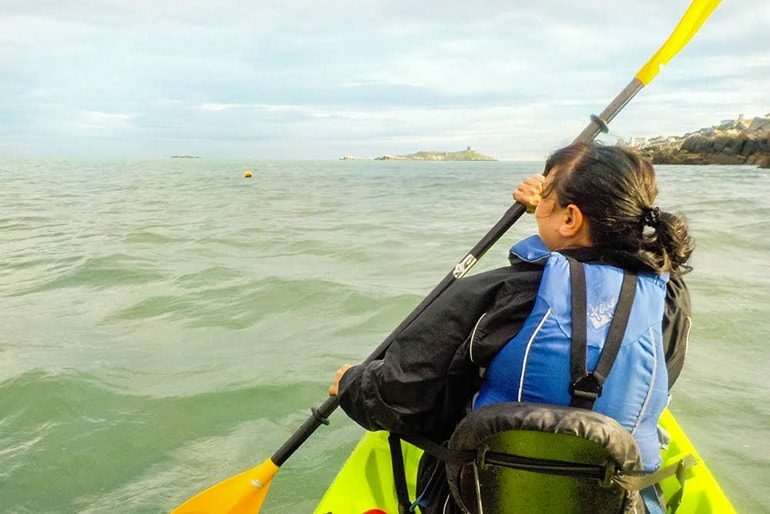 Think of kayaking in Dublin and you think of the river Liffy, but if you travel 20 minutes out of the city, you can have a more adventurous kayaking experience in Dalkey. It was October when I went sea kayaking in Ireland, so the weather wasn’t the warmest, but it was doable. The kayaking company provided a wet suit, a life jacket and shoes – although I recommend you bring your own pair that you don’t mind getting wet. We set off from Bullock Harbour in Dalkey into Dublin Bay. It was a pretty windy day, so we had to paddle pretty hard against the wind to avoid being pushed back in the wrong direction. Our destination was Dalkey Island, a former Viking settlement and now home to a colony of about 60 seals. Despite our aching muscles due to the extra effort we had to put into to get there, it was a real treat to explore the ancient ruins of the island, which include a small chapel and a Napoleonic Fort. But the cherry on the cake was to be able to observe the resident seals lounging on the rocks. And the more curious ones even came to say goodbye as we paddled away from the island! Sadly, my GoPro stopped working as we set off, so I couldn’t take any photos of the seals, but here’s a photo of me taken by my kayaking partner Bill Fink. And there you have it – some of the best Ireland travel tips these bloggers can come up with! What do you think? Have you done any of these before? Anything we should add to the list? If you want to have a look at other things you can do all around Ireland check out Get Your Guide for some of the top attractions. Get in touch and let us know what you get up to in Ireland – we’d love to know what part you love to travel to!